PRIVATE INSTRUCTION – Education That Tastes Good! Would you like to learn to cook in a more personalized setting? Pink Sparrow offers one-on-one training right in the comfort of your own kitchen. Seasoned chef Jennifer Sperling will take you through basic cooking techniques, train you on product knowledge and proper cooking equipment, and help you produce a gourmet three-course meal! If you’re looking for an easy way to improve your skills and dazzle your friends and family, Pink Sparrow will help you every step of the way. Pink Sparrow classes take place right in your own home, so it couldn’t be easier for you! We bring all of the food and most of the equipment required, so all you would need to provide is a clean kitchen. And after class, while you’re enjoying the fruits of your labors, we provide full clean up, so we leave your kitchen sparkling and your bellies full. 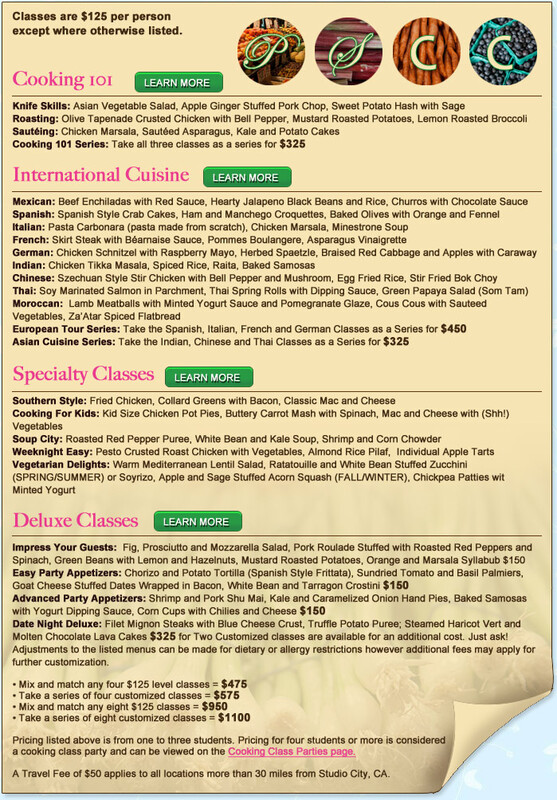 Have a look below at some of the many menu options we offer, and when your stomach stops growling, give us a shout!